NASA's new Space Launch System has some big missions planned. It will carry astronauts back to the moon, and it could carry big science instruments like the Europa Clipper to Jupiter in half the current travel time. But the focus in Huntsville this week wasn't on the big things SLS could do. It was on 13 cubesats slightly bigger than a shoebox and the adapter built in Alabama to launch them from the first SLS flight around the moon. "It's hardware built at Marshall Space Flight Center and designed by an engineer who grew up here," said Andy Schorr, assistant manager of the SLS Spacecraft Payload Integration and Evolution Office. "It shows we can be adaptable, we can be agile. We're extremely proud of it." Shore was talking at a media preview of a stage adapter and launch platform 5 feet tall and 18 feet wide. It was built at Marshall of curved aluminum alloy plates using friction stir welding, a process that basically melts and blends the edges of the plates into a single piece. 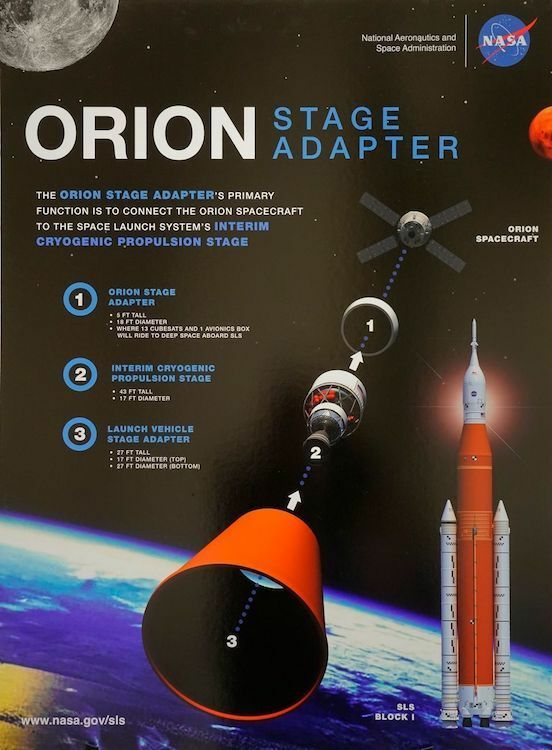 The adapter will sit on top of first SLS test rocket just below the Orion capsule and hold the cubesats until time to launch them into deep space at a series of what NASA calls "bus stops" favorable to each experiment. Lead adapter engineer Brent Gaddes explained the adapter's construction to reporters who donned protective booties to climb a platform in the clean room overlooking the ring. He also pointed to another ring adapter sitting a few feet away that the center is building for the second SLS flight, the one with astronauts aboard. Building those adapters in Huntsville highlights a return to large rocket part construction that started at Marshall with the Saturn program and the International Space Station. As for the cubesats, they represent a push to get the most for the money it will cost to launch SLS the first time. "It's the first time cubesats will be launched in deep space," SLS secondary payload manager Kimberly Robinson said of the first flight. NASA announced the opportunity, vetted the replies and selected the best ideas from its own ranks, international partners and universities. One Japanese experiment, OMOTENASHI, will attempt to put a small lunar lander on the moon's surface. The idea is to test low-cost missions to investigate the moon. Marshall has its own cubesat called NEA Scout. Powered by a solar sail, it will fly by an asteroid gathering data and testing the sail propulsion method. Les Johnson of Marshall is leading NEA Scout with partners at the Jet Propulsion Laboratory. The adapter will now head to Kennedy Space Center in Florida in about a month aboard NASA's Super Guppy airplane. There, it will wait with other parts of SLS for assembly and launch now scheduled for December of 2019. NASA followed up the first RS-25 test of 2018 with a second hot fire of the Space Launch System (SLS) engine on Feb. 1 at Stennis Space Center near Bay St. Louis, Mississippi. 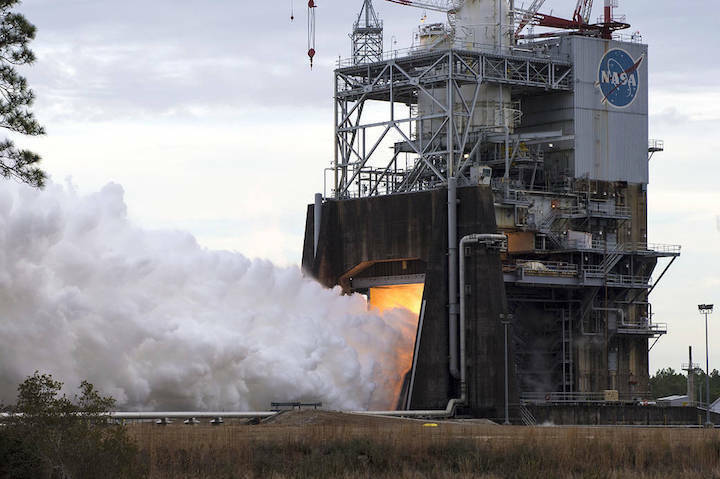 The full-duration, 365-second certification test of another RS-25 engine flight controller on the A-1 Test Stand at Stennis comes about two weeks after a Jan. 16 hot fire. The test marks completion of green run testing for all four of the new RS-25 engine flight controllers needed for the second flight of NASA’s SLS rocket. NASA is building SLS to send humans to such deep-space destinations as the moon and Mars. The Exploration Mission-1 (EM-1) flight will test the new rocket and carry an uncrewed Orion spacecraft into space beyond the moon. Exploration Mission-2 (EM-2) will be the first flight to carry humans aboard the Orion spacecraft, returning astronauts to deep space for the first time in more than 40 years. RS-25 controllers for the EM-1 flight already are installed on the engines that will be part of the SLS core stage. In addition to the flight controller, the Feb. 1 hot fire at Stennis also marked the third test of a 3D-printed pogo accumulator assembly for the RS-25 engine. Testing of the 3D-printed component is part of an ongoing effort to use advanced manufacturing techniques and processes as a means of reducing engine construction costs. NASA plans to test a number of 3D-printed components for the RS-25 engine. For the recent test, flight controller ECU 11 was installed on RS-25 developmental engine E0528 and fired under conditions akin to an actual launch. Each RS-25 hot fire is designed to test and evaluate the performance of the engine and its components in specific scenarios. Typically, an engine is cycled through various thrust levels that may be needed during flights to help engineers gather as much performance data as possible. Once certified, tested flight controllers are removed for installation on flight engines for the SLS rocket. All RS-25 engines and flight controllers for SLS missions are being tested at Stennis, as is the flight core stage for the first SLS mission. SLS core stage testing will involve installing the stage on the B-2 stand at Stennis and firing all four of the RS-25 engines simultaneously. At launch, the four RS-25 engines will fire simultaneously to generate 2 million pounds of thrust and working in conjunction with a pair of solid rocket boosters to produce more than 8 million pounds of thrust. RS-25 engines for initial SLS flights are former space shuttle main engines, modified to provide additional power to launch the larger SLS rocket. The new flight controller is a key component of that modification, serving as the RS-25 “brain” to help the engine communicate with the SLS rocket and to help control engine operation and internal health diagnostics. RS-25 tests at Stennis are conducted by a team of NASA, Aerojet Rocketdyne and Syncom Space Services engineers and operators. Aerojet Rocketdyne is the RS-25 prime contractor. Syncom Space Services is the prime contractor for Stennis facilities and operations. The Space Launch System (SLS) has been a very polarizing project in the space enthusiast community. That is also true to a significant degree among space professionals. One can find both defenders and detractors of SLS in many sub-categories such as: Moon-Firsters, Mars-Firsters, human explorationists, robot explorationists, and O’Neillians, to name a few. NewSpace partisans are the only significant subset of space enthusiasts who are nearly unanimous in their attitude toward SLS: they’re against it. To put my own cards face-up on the table, I’m against it too. Every significant advance by a NewSpace company—especially SpaceX—is often seen by NewSpacers as an omen of SLS’s imminent demise. SLS’s defenders of all stripes, as well as the cynics in the crowd, see SLS as still effectively untouchable given all the political and institutional wind at its back. The defenders regard this as a good and justifiable thing. The cynics don’t. But, Falcon Heavy or no Falcon Heavy, SLS just seems to both camps to be, inevitably, a long-term feature of the space development landscape. But, Falcon Heavy or no Falcon Heavy, SLS just seems to both camps to be, inevitably, a long-term feature of the space development landscape. But is this really true? But is this really true? Is there something out there that could knock SLS down? As a long-time Californian, my go-to analogy for any kind of upheaval is the earthquake. If SLS’s base of support was a rock stratum, any geophones placed in it would be monitoring foreshocks of growing frequency and magnitude. The SLS schedule has slipped rightward at least 18 months over the past two years. That rate of slippage is rapidly closing in on the one that got Constellation cancelled. These slippages have been accompanied by numerous critical reports from the NASA Office of Inspector General (OIG) and the Government Accountability Office (GAO). These events are all analogous to local quakes of magnitude 2.5 or so that most people don’t notice even when they occur directly underfoot. I’d regard that statement as equivalent to a ground shock sufficient to make the house shake a bit and rattle the dishes in the cupboards. Given that Babin is not retiring, I’d rate that statement a couple tenths higher than Rep. Smith’s on the Richter scale of OldSpace politics—strong enough to knock some canned goods off shelves in the pantry. Finally, there is the odd spectacle of SLS prime contractor Boeing’s CEO, Dennis Muilenburg, telling Jim Cramer on TV, in response to a question about SpaceX, that, “Eventually we’re going to go to Mars, and I firmly believe the first person that sets foot on Mars will get there on a Boeing rocket.” Muilenburg has evidently been including this line in his presentations for some time, but this instance was high-profile and got a lot of attention. I can’t analogize this remark to a level of earthquake intensity. Instead, it seems more analogous to the pre-quake agitation long known to be exhibited by many different animal species. Perhaps Muilenburg dimly senses the ground beneath his feet beginning to fail him at some subliminal level. Methinks he is likely correct. Regarding SLS, then, the recent successful launch of Falcon Heavy rates as a 4.0+ foreshock: sufficient to break a few windows and even collapse a few of the flimsiest carports, porch overhangs, and decks. We’re still far away from The Big One, which will, at a minimum, render SLS a Red Tag case or, at worst, utterly obliterate it. But there also seems little question that predicting at least an approximate date for the SLS’s Big One is a lot more straightforward than doing the same for the San Andreas Fault. The “official” estimated launch date for the one-off, never-to-be-repeated, 70-tons-to-LEO SLS Block 1 is now December 2019. The unofficial but more realistic projection is more like May 2020. 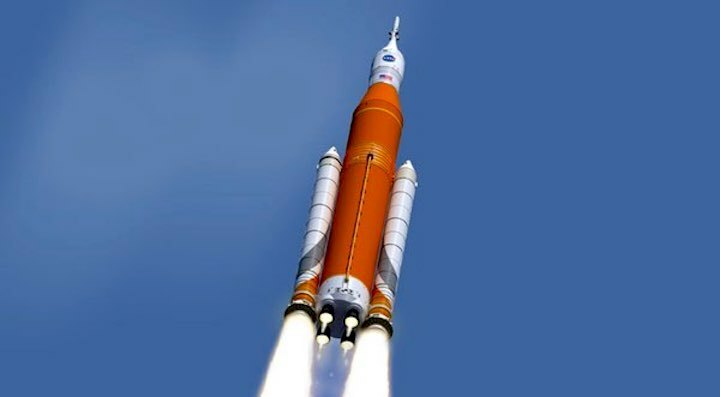 After that, 33 additional months will be required to refit the Vehicle Assembly Building and the rest of SLS’s launch infrastructure to handle the SLS Block 1B equipped with the bigger Exploration Upper Stage (EUS) that will boost its LEO lift capacity 50 percent to 105 metric tons. SLS Block 1B, thus, will not fly until well into the second half of 2023. It strikes me that that is surpassingly unlikely ever to happen, for two reasons. First, SLS, as currently envisioned, is a farce. Its development has been glacial and insanely expensive. It plows absolutely no significant new technological ground. It will be slow and insanely expensive to build. It is entirely expendable. Its associated spacecraft, Orion, is, at best, a Moon-craft, lacking heat shielding sufficient to withstand an Earth return from any significantly more distant point and, in any case, having life support capability for only 12 person-weeks of continuous occupancy. All these massive shortcomings are well-known in the space community, but not to the general public. And that brings us to our second reason to predict SLS’s demise: the withering effect of public ridicule on unjustifiable government projects that get spotlighted. When the two late-night Jimmys start putting “Rocket to Nowhere” jokes in their monologues, SLS will be toast. And something along those lines seems virtually certain to occur. SLS is simply one more government project, liberally marinated in absurdity, that continues because it has, thus far, flown below the public’s radar. Absent public outrage or, even worse, public ridicule, many such projects have soldiered on in obscurity for long periods based entirely on the politics of parochial self-interest and mutual back-scratching. But no amount of political influence tends to be able to save these things when the general public takes note. Especially when they laugh. The now-dead Gravina Island Bridge proposal in Alaska, better known as “The Bridge to Nowhere,” is a particularly ripe example of such. So long as it was proceeding largely out of public view, the bridge project moved along. Once it became a cause célèbre no amount of backroom political dealing could save it. SLS is a much bigger and more expensive deal than “The Bridge to Nowhere.” Among space enthusiasts opposed to it, SLS has long been derisively, and pointedly, referred to as “The Rocketto Nowhere.” All that is required for it to meet the same fate as the Gravina Island Bridge is a sufficient rise in its public prominence. When the two late-night Jimmys start putting “Rocket to Nowhere” jokes in their monologues, SLS will be toast. And something along those lines seems virtually certain to occur. As things currently stand, I think the most probable timeframe for SLS’s quick rise to the status of notorious laughingstock—the progammatic equivalent of a San Andreas 8.0+—is sometime during the year 2020. By that time, Falcon Heavy will have flown a number of times, New Glenn will likely have made its debut launch as well and, most consequentially, SpaceX’s BFS—the “spaceship” upper stage of its BFR launch system—will likely be well into a series of suborbital test hops that seem likely to be widely noted by the general public. Who doesn’t love watching a real, honest-to-gosh giant spaceship taking off, then coming back down on a pillar of fire? SLS, if it is fortunate, will launch sometime in 2020. If, as seems entirely possible, SLS is still not ready, even in Block 1 trim, by 2020, it may well never launch at all. The comparison of SLS to New Glenn and BFR/BFS will be withering. And the comparisons will be made. When New Glenn and BFS start flying, both Bezos and Musk will spike in the public’s awareness. More news and talk-show appearances will be inevitable. Bezos will be smooth. Musk will do more of his lovable boyish prankster shtick. Neither will say anything explicit against SLS or NASA, but the interviewers can be counted upon to see to that little chore. SLS will go from public obscurity to a safe late show monologue target and the program will suddenly find itself in existential jeopardy. So, what happens then? The likeliest outcome, frankly, is complete cancellation of the SLS-Orion program. There is a small, but non-zero probability, though, that at least some of SLS’s backers might be able to salvage part of the program. That will depend critically upon how flexible they are prepared to be and how ruthlessly they are willing to be in pushing some of their erstwhile fellow-travelers out of the lifeboat. I see no scenario in which the entire SLS coalition gets out of the approaching crackup unscathed. Even in the best possible case, some will still go down with the ship. SLS’s partial survival will also depend upon how convinced its shot-callers are that their backs are really up against a wall when the crunch comes. I’m, frankly, not too hopeful on this point. Sen. Richard Shelby and SLS’s lesser godfathers have gotten a lot of mileage for a very long time out of doing their time-immemorial thing and keeping a low profile. When the SLS jig is finally up, they may simply fail to accept reality, a proclivity not exactly unknown in the political world, especially lately. If that proves to be the case, then SLS will suffer complete cancellation, get a modest headstone once buried, and life in the space development community will go on without it. But maybe the choice doesn’t have to be quite so stark. A couple months back, Donald F. Robertson, a San Francisco Bay Area banker and angel space investor who comments frequently on space-related forums, and who, like me, is not an SLS supporter, published an op-ed titled, “A house divided, or in this case, a rocket”. The piece was a sort of Rodney King-like “Can’t we all just get along?” appeal to both sides of the SLS debate and a call for developing some sort of compromise that would primarily address keeping as much of the SLS workforce as possible employed while doing away with SLS. Robertson supplied no detailed proposal that would meet his own criterion. I do not fault him for this as I strongly suspect it is not possible to devise one. If SLS goes entirely down, everyone whose job mostly or totally depends on it is likely to be unemployed as a result. Even if SLS can be partially saved, a lot of current SLS workers will be laid off. Making the SLS first stage reusable would eliminate one of its key deficiencies: it’s effective inability, because of its current expendability, to realistically support any mission that depends upon multiple launches. John Jay Chapman, a late 19th and early 20th Century American writer and anti-corruption political activist, pithily said the following; “People who love soft methods and hate iniquity forget this—that reform consists in taking a bone from a dog. Philosophy will not do it.” In other words, the key people behind SLS won’t be willing to make any sort of deal until the program is literally tied to the stake and the firing squad is forming up. Short of that, they will try to brazen it through. So, if one were to swoop in just as the man with the blindfold and the cigarette strides out and could offer the condemned some kind of reprieve, what should it look like? I think the minimum acceptable bottom line would be to remake SLS into something actually useful for some purpose other than employing too many people in key political constituencies. That requires that SLS’s 1st stage, at least, be re-engineered to be reusable. Doing so would eliminate one of SLS’s key deficiencies: it’s effective inability, because of its current expendability, to realistically support any mission that depends upon multiple launches for accomplishment, notably human missions to Mars. Given SLS’s baseline one-per-year production rate, any multi-launch mission architecture is ruled out by the multiple years it would take to do the multiple launches. Reusability removes this very significant current SLS restriction. A stage that takes a year to build, but is reusable, can fly multiple missions in the time it takes for a second such article to be built. So how would one go about rendering the SLS core stage reusable? It’s RS-25 engines are already reusable—at least those of Space Shuttle heritage. The supposedly non-reusable RS-25E that Aerojet Rocketdyne is working toward building could be re-designed to require it to be at least as reusable as its shuttle-veteran forbears. But a reusable stage also needs to be able to land. It needs legs to do so. Either SpaceX or Blue Origin would be the logical source for these. Such a stage would also need a center, or near-center, engine. The RS-25 configuration of the SLS core stage’s current design isn’t suited to this job: there’s no center engine. One might add a fifth RS-25 at the center of the core stage’s base, but the RS-25 is over-strong for the landing job and isn’t deeply throttleable. I think the straightforward solution would be to put a small cluster of Blue Origin’s BE-3 engines in the center of the SLS core stage’s base. The BE-3 exists, works, is air-startable, is throttleable down to 20 percent of its 110,000-pounds-force maximum thrust and runs on the same hydrolox propellant as the SLS core stage’s RS-25s. Four BE-3s would provide a bit more thrust on liftoff than a fifth RS-25 and would allow the stage to land without “hoverslamming” even if one engine failed. The solid boosters have to go too. First, because they are expendable. Second, because they are also seriously production-limited if one wishes to conduct multiple missions per year. Third, because they complicate abort provisions should the revised SLS ever carry people. What to replace them with? There is a video up on YouTube done using Kerbal Space Program that depicts a mission using an SLS boosted by four SpaceX Falcon 9 1st stage cores in place of the currently-planned expendable solid rocket boosters (SRB’s). Obvious questions, at this point, are two that R-SLS would inherit from its present-day SLS ancestor, namely, who needs it and for what? But why stop there? The SLS could be redesigned to go well beyond the 130-metric-ton LEO lift capacity planned for its problematic Block 2 configuration. The SLS core stage’s 8.4-meter diameter could be ringed snugly by tenFalcon 9 cores. Doing this would transform SLS from a would-be Saturn 5 into a truly ultra-heavy brute lifter. Using very reusable Block 5 Falcon 9 cores, such a beast would generate over 21 million pounds-force of liftoff thrust and could haul as much or more to orbit, reusably, as SpaceX’s 2016 Interplanetary Transport System concept. Anyone who thrilled to the sight of Falcon Heavy’s two side cores landing should be ecstatic at the prospect of seeing a kick line of ten of them landing in line abreast. Of course, such a beast would also have 98 engines firing simultaneously at liftoff. But, as the recent Falcon Heavy demo flight amply demonstrated, there’s no reason to be fazed simply by a large engine count. Engineering would actually be easier than for the Falcon Heavy as each Falcon 9 core in the booster ring would brace its adjacent neighbors as well as attaching to the SLS core stage. Much less scope for inimical vibration modes or aerodynamic flutter. Ideally, reusable SLS (R-SLS) should also have a recoverable second stage. That lets the currently envisioned EUS out. And its four RL10 engines are too dinky to sit atop the huge, and hugely revised, R-SLS. By the time R-SLS could be redesigned and built, the best choice of basis for an appropriately scaled 2nd stage would be SpaceX’s BFS—at least the freighter and tanker versions of same—which both should have been flying for some time by then. To carry the maximum mass which R-SLS could launch, the standard BFS design would likely need some beefing up of its structure, but most components should carry over without issue. The answer to the first is that US Air Force will need it, as will any Space Force successor organization. USAF and NRO now seem firmly committed to deploying swarms of small satellites instead of a few Rolls Royces to accomplish all existing, and some new, missions. The Air Force also intends to overhaul its procurement infrastructure along the way. But mere proliferation is not enough to discourage adversaries. That brings us to the what question. In a word, armor. Armoring all these new birds against kinetic energy, and even beam weapon, attack also needs doing. The R-SLS brute lifter could earn its keep doing this job. Some notions about what this might involve are part of a future article. So more on that later. If the Air Force is the prime beneficiary of R-SLS it would seem reasonable, also, that part of the political deal to save what can be saved of SLS would detach Marshall Space Flight Center (MSFC) from NASA and return it to its military roots as an Air Force part of Redstone Arsenal alongside the Army organizations already resident there. As MSFC is on Arsenal property, employees wouldn’t even have to move, though some would likely be less than thrilled by the changeover. Its supporters in Congress should support such a realignment as it would keep MSFC from its probable alternative fate of becoming a ghost town in the wake of SLS’s outright cancellation. Cancelling the SLS’s SRBs. That’s going to annoy the Utah Congressional delegation and put Northrop Grumman’s nose out of joint too, as it recently purchased Orbital ATK. But politics is the art of the possible. There just won’t be anywhere near as much pork to be had as there was formerly. Splitting the current SLS coalition is part of the positive political fallout to be expected from the R-SLS deal. I think the Alabamans can hold their own against the Utahans. Preserving the Michoud factory site. This adds the Louisianans and the Mississippians to the Alabamans in facing down the Utahans. Cancelling Orion. This will also put some noses out of joint, but fewer and less powerful ones than in the case of cancelling the SRB’s. It also puts a second of the remaining three OldSpace primes outside the R-SLS “family”—a good thing in my view. Bringing in SpaceX and Blue Origin as co-primes alongside incumbent Boeing. Boeing has a lot it needs to learn from SpaceX and Blue. Boeing’s CEO doesn’t seem to get this. Aerojet Rocketdyne gets more work from R-SLS than it deserves, but less than it would certainly like. On the other hand, it should manage to survive and would have another chance to learn how to go on doing so in the new increasingly commercial space business. If SLS gets cancelled outright, AR probably folds. I think that, whether R-SLS happens or not, the Air Force’s notion to rebuild space procurement from the ground up is going to turn out to be a pathfinder mission for the rest of the US military. Current practices need fundamental overhaul. The airtight tripartite oligarchy of legacy primes needs to be breached, big time. I think this is coming. It would be nice if space leads the way.